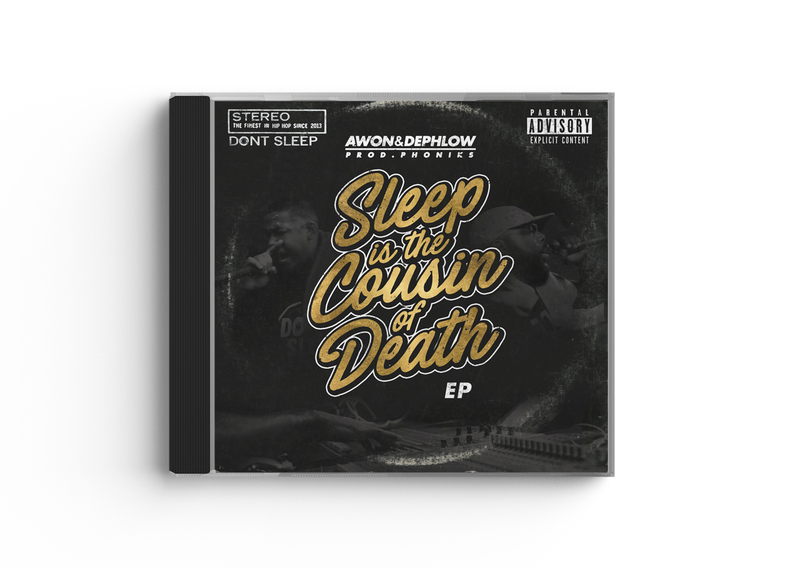 'Sleep Is The Cousin Of Death' is the latest release from Hip-Hop collective Don't Sleep Records. The project features Virginia's own Awon & Dephlow on the mic and producer Phoniks on the boards, recreating the chemistry from their highly celebrated debut "Dephacation" in 2014. Dephlow's booming mic presence is complimented by Awon's slick, smooth delivery as the two eMCee's weave in-and-out through a compilation of Phoniks turntable cuts and somber boom-bap instrumentals. The trio proves that they haven't missed a beat since their debut, and Don't Sleep Records remains one of the best / most consistent collectives in underground Hip-Hop. The project is available digitally using the 'Name Your Price' feature on Bandcamp, on CD and Vinyl, as well as limited edition posters. The project will sell out, be sure to support it while supplies last.